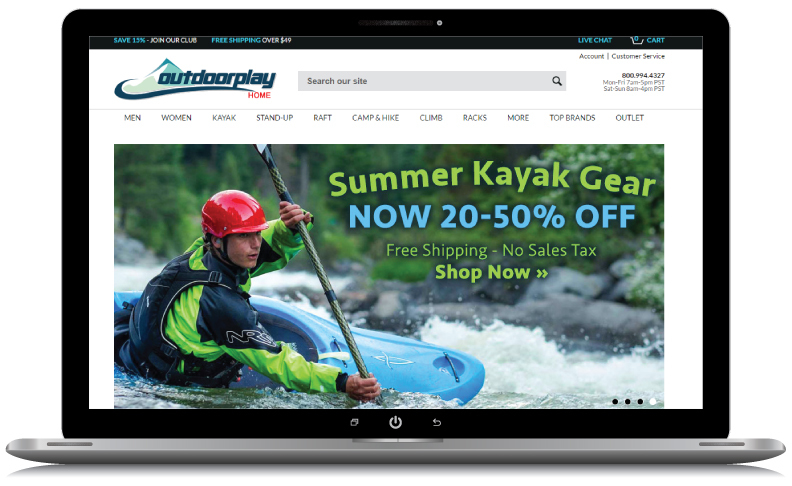 A startup based out of a garage, Outdoorplay began as a one man kayak school in 1995, nurturing a loyal customer base into a thriving Northwest retail operation. In 1998, partnered with WebRock Design, Outdoorplay took the business online and hit the ground running. With a robust eCommerce platform, effective email campaigning and a rock solid fulfillment system in place – 100% customer satisfaction was achieved right out of the gates. As a result, OutdoorPlay quickly became a significant player in the online sports equipment arena. Sixteen years later, Outdoorplay continues to partner with WebRock Design, looking to their expertise and creative vision for guidance as they successfully retain majority market share, showing sales in excess of $5+ million dollars annually.